Animal movement decisions and associated rates of energy expenditure have important implications for survival and fitness, which in turn scale up to shape broader population dynamics. In coastal marine ecosystems, environmental conditions that promote resource availability are highly dynamic, necessitating the ability of foraging individuals to continually modify their behaviors over time. However, due to environmental disturbances, particularly those borne of anthropogenic processes, animals are often diverted from their normal activities, resulting in reduced efficiency of movement and potential fitness impacts. Modern technologies have allowed remarkable insights into the foraging behaviors of animal populations, but often lack an important component of variation: that within the individual. A key line of inquiry is now: which individuals modify their behaviors in response to changing conditions, how do they do so, and what are the consequences? Answers to these questions are necessary to further understand both the ecological effects of environmental disturbance and the mechanisms by which individual specializations may arise within populations. In the northern Gulf of Mexico, brown pelicans (Pelecanus occidentalis) navigate a foraging landscape that is patchy and dynamic at a variety of scales due to both natural and anthropogenic stressors. The species is therefore an ideal subject through which the trophic dynamics of the Gulf, as well as the broader significance of behavioral plasticity in uncertain environments, can be understood. 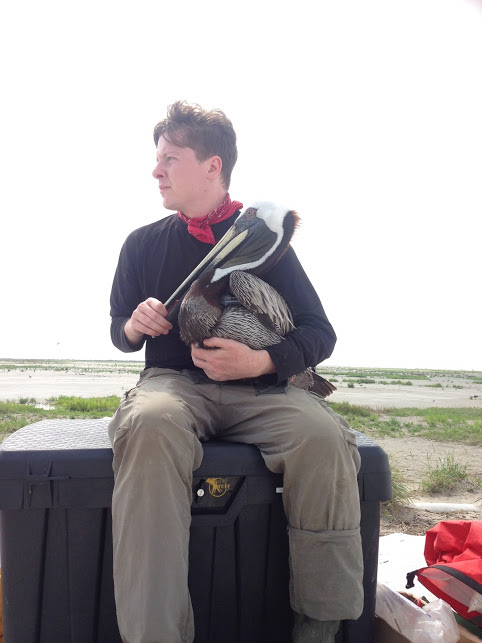 From 2012-present, we have attached GPS transmitters and accelerometers to breeding adult pelicans on Raccoon Island, the largest colony in coastal Louisiana. Particular focus is given to the fluctuation of behaviors within monitored individuals across time, especially in response to known environmental disturbances and changing marine conditions. We have also performed a regional assessment of pelican population genetics in the northern Gulf, providing valuable baseline measurements of diversity and population structure in the event of future disasters that cause mass mortality and/or dispersal events. Upcoming work will combine our findings thus far with expanded accelerometer analysis, ecotoxicological assays, and extension of field work to additional colonies to understand the relative contributions of foraging energetics, environmental cues, contaminant exposure, and restoration activities to population-level processes in heavily disturbed systems such as the northern Gulf. These and future results will provide unprecedented insights into the movement ecology and demography of an important seabird, which will provide valuable information to behavioral ecologists as well as barrier island restoration efforts currently underway throughout the Louisiana coast.